Anywhere Else, They Would be Exceptional: Can you Succeed at this Yosemite Valley Scavenger Hunt? I've been privileged to visit Yosemite Valley dozens and dozens of times over the years, often dragging students, and sometimes with just me and Mrs. Geotripper. We always revel in the beautiful sights, and study the various moods of iconic features like Yosemite Falls, Half Dome, and El Capitan. But there are many times when I notice other unique geological features that in any other setting on the planet would probably be the centerpiece of a national or state park. They get lost in the grandness of this extraordinary landscape. That is the reason for today's post. If you are ever lucky enough to visit Yosemite Valley, take your pictures of Half Dome and Bridalveil Falls, but keep an eye out for some of these other exceptional rocks and waterfalls. First up is North Dome (above). 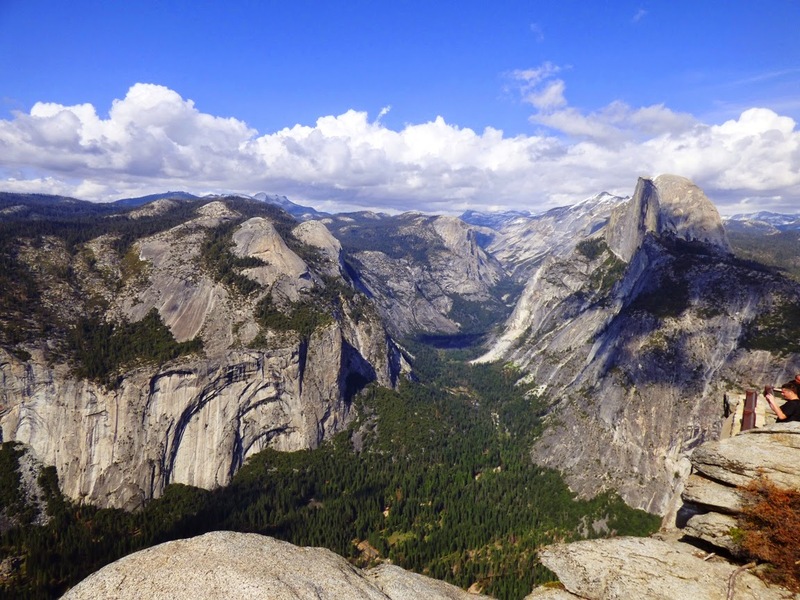 Just think about it...aren't you just settling for less when you concentrate on Half Dome? Why not a whole dome? It's there if you know where to look (or you know how to read a map!). Silver Strand Falls suffers from "backwards distraction". Some sights in Yosemite are so awesome that you can't do anything but stare. And never turn around to see what is happening behind you. There is an epic sight in the opposite direction and thus you might never notice it...a 574 foot high waterfall! It's especially spectacular in winter when the waterfall may be entirely frozen. Another sight that gets lost in the shuffle of the big views in Yosemite Valley is Sentinel Dome. 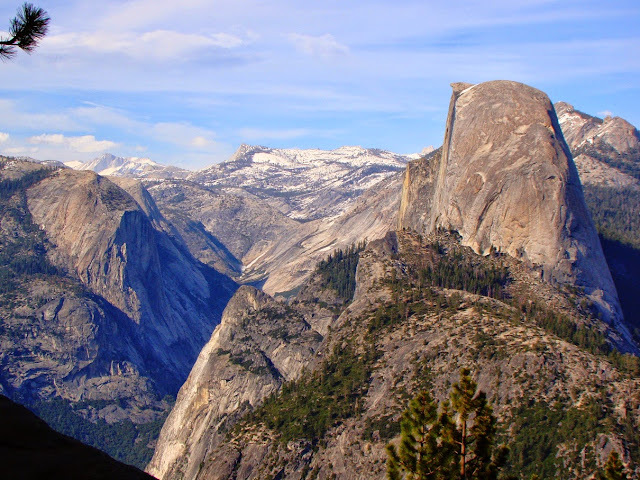 It's another "whole dome", and while it is not as imposing as Half Dome, it's a great deal easier to climb. In fact, the trail to the summit is only a mile long, and the view is stunning. Is it possible to simply not see a 1,180 foot high waterfall? It seems like it would be hard to miss, but that's the case with Lehamite Falls. 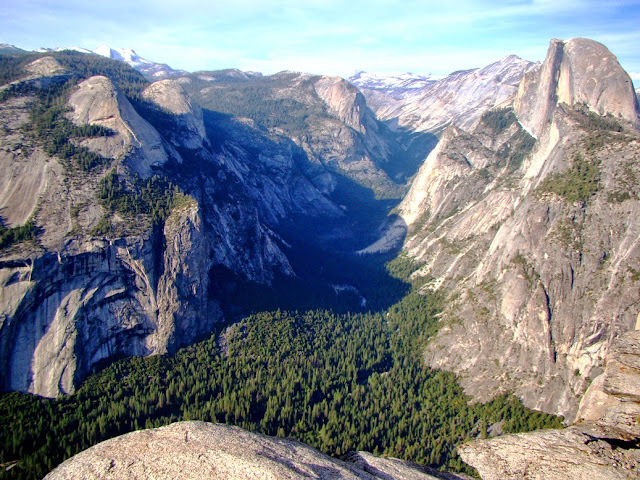 It has the distinction of the only feature in Yosemite Valley that retains its original Ahwaneechee name. It's not behind some other feature. In fact, it often appears on the edge of shots of one of the iconic waterfalls of Yosemite. There is another waterfall that can be easy to miss. Staircase Falls can be heard splattering down the cliffs behind a well-known pizza shack in Yosemite, but it often gets missed in the shuffle. It's 1,300 feet high, just short of Upper Yosemite Falls (although it descends in a series of...stairs). Finally, can you guess the location of this stunning example of exfoliation in action? Exfoliation is the tendency of newly exposed rocks to break in planes that are parallel to the surface of the rock, causing the monolith to eventually take a dome-like shape. 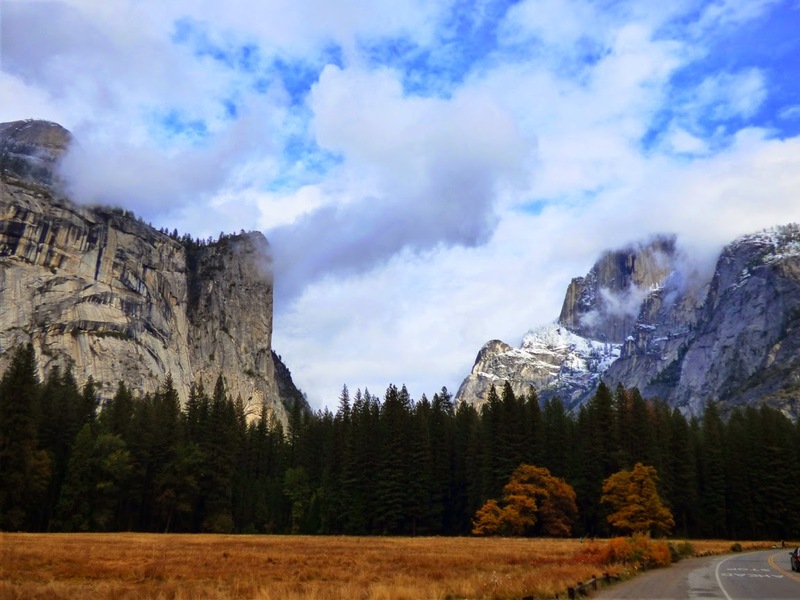 Do you know Yosemite well? What features do you think don't get enough attention by park visitors? I've been to Yosemite Valley twice in the last month, including a day when the Merced River was still at flood stage. I was reflecting on the many journeys I've made there with my students and with Mrs. Geotripper, and what a stunning place it truly is. I was thinking of a new angle to present some pictures of the latest trips, but then my good friend @phaneritic on Twitter asked a question about quotes concerning the valley that don't involve the writings of John Muir (as wonderful and poetic as his words were). 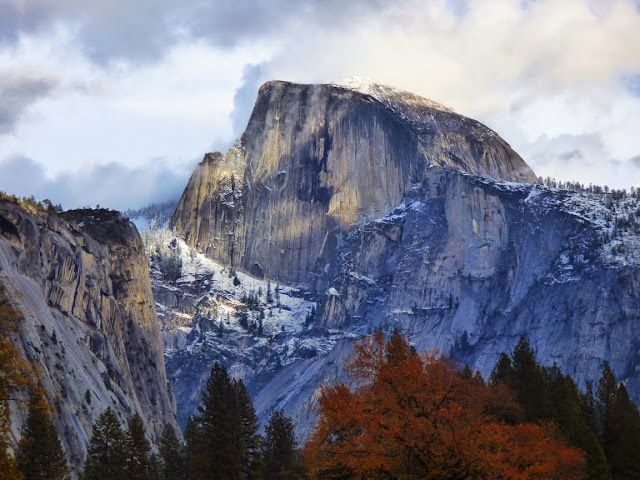 I realized I had written about some of the legends of Yosemite a few years ago, and decided it was time to bring some of them back, in case they were missed before. These stories also have relevance to the moment because of the decidedly stupid legal war over trademarks being waged between the National Park Service and the recently departed Delaware North concessionaire. One current sign of the ongoing legal battle is the new name for the Ahwahnee Hotel ("Majestic Yosemite") and Curry Village ("Half Dome Village"). Half Dome is a very plain name for such a stupendous rock, and I am thinking the park service missed an opportunity. Tis-sa-ack Village might have been a mouthful to pronounce, but it gives the rock a history and an air of mystery. Do You Know the Tallest Waterfall in Yosemite Valley? You Might Be Wrong! Quick quiz: What is the name of this waterfall? What is the highest waterfall in Yosemite Valley? Depending on the parameters one can use to determine "height", your assumption may be wrong! Most "authorities" recognize Yosemite Falls (2,425 feet/739 meters) as the highest in Yosemite Valley and North America, and somewhere around the fifth or seventh highest in the world. But it depends how you decide to measure waterfalls. By a different metric, Yosemite Falls aren't even the highest waterfalls in Yosemite Valley. It's the word "waterfalls", in the plural, that makes the difference. There is no doubt that Yosemite Falls is one of the most stunning sights on the planet. A chance movement of a glacier 13,000 years ago forced a middling stream from its old channel to the left of the current waterfall, forcing Yosemite Creek to drop right off the edge of the sheer cliff. You can see the old channel almost hidden in the shadows in the photo above. The fall makes a sheer plunge of 1,430 feet (440 meters) at the Upper Fall and then cascades through a series of steep ledges called the Middle Cascades for 675 feet (206 meters). 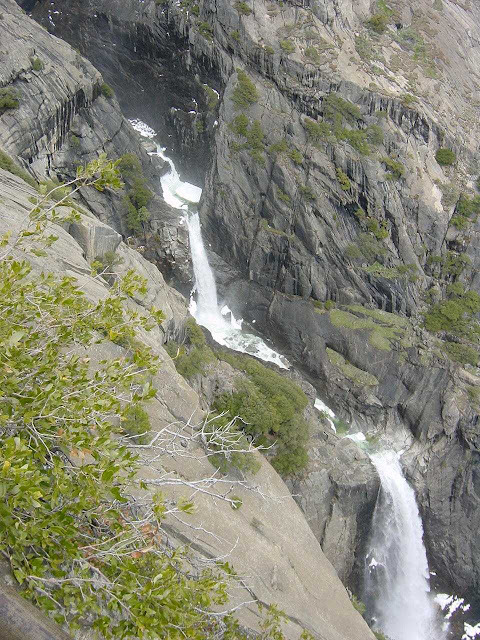 There is a final drop of 320 feet (98 meters) at Lower Yosemite Fall. The Middle Cascades are generally hidden from view unless you hike the steep trail up to the top of the falls (below). But if one decides to be a purist about such things, one can define a waterfall's height on the basis of the greatest freefall. By that metric, Yosemite Falls still is an imposing 1,425 feet (739 meters) high. But it also means it's not even the tallest waterfall in Yosemite Valley. Many first-time visitors to the valley are drawn to Bridalveil Falls (620 feet/189 meters) because it is the first major waterfall visible as one enters the valley. But when standing at the base of Bridalveil, they see another high waterfall across the valley and wonder if it is Yosemite Falls. It's not. It's called Ribbon Fall, and it has a single drop of 1,612 feet (491 meters). That's nearly 200 feet higher than Upper Yosemite Falls (it's the one in the picture at the top of the post). It is less familiar than many of the other waterfalls because it is usually dry by June when the majority of people visit the park. But if you get the privilege of seeing by visiting in the spring, you are in for a treat. I have been trying to get a particular picture of Ribbon Fall for a long time. When driving towards the Tunnel View parking lot from Bridalveil Falls, there is a panorama of Ribbon Falls and the cliff of El Capitan, but there is no way to stop or pull out to get the shot, and the road is too narrow for walking. But yesterday I was there with my students in a bus. Since I wasn't driving, I was ready with the camera as we came back down the road, and I finally got it (below). Ribbon Falls is one of many treasures that make a spring visit to Yosemite Valley a worthwhile effort. It's possible that I have the best job in the world. I know there are people who make more money and all that, but making money can only provide so much satisfaction. I get to be involved with people working hard to make their lives better, and I have to say that there is almost no feeling better than witnessing the success of people who mastered difficult concepts under your guidance. Graduation ceremonies are fun in their way, but my favorite moment comes just before finals week and all the ceremonies that follow. It is our Science, Math and Engineering Awards. It's the moment when we can honor and congratulate those students who rose above whatever challenges they had and excelled in their science courses here at Modesto Junior College. And that's one thing about being in a small department with relatively small classes. You learn in great detail the kinds of things that students in today's community colleges are up against. There are job pressures (in many instances they work at more than one of them). Many of them have young children with all of the attendant challenges of parenthood on top of their school work. Many come from families with serious problems, and many are the first in their family to take on the responsibility of a college education. For them, it's a victory just to be in college at all. Imagine the pride they have when they overcome these serious challenges and succeed. And that's what today is all about. I got to honor my outstanding students with Certificates of Achievement in Geology (there were five of them, in the picture above; the others were honorees in the Earth Sciences). I also got to surprise Marissa, third from the left, with the Outstanding Student in Geology for the academic year. Oh, I was also privileged to be the speaker for the night's festivities. I was having a bit too much too much fun criticizing the depiction of geologists in Hollywood movies. You can get a hint of the nature of my remarks here: https://geotripper.blogspot.com/2008/03/accretionary-wedge-carnival-7-hollywood.html. But for the vagaries of the weather, we would never have seen it. 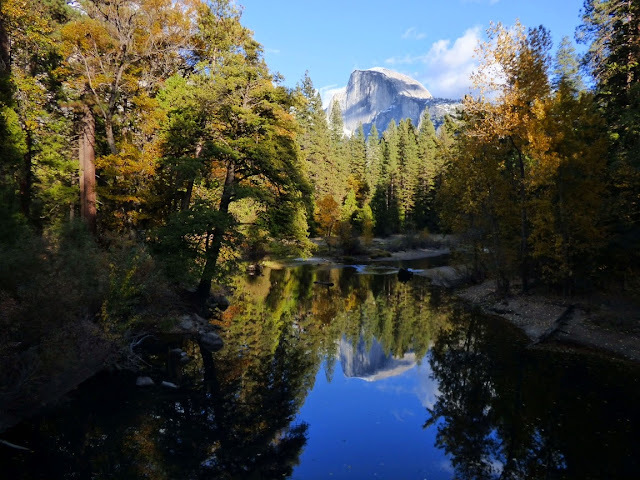 Running field studies courses in the winter and spring always involves an element of chance, but in the dry year that we've had, it seemed safe enough to schedule a trip to Yosemite National Park in early April. But as the previous two posts have shown, an epic atmospheric river storm, a Pineapple Express, pummeled the area last Saturday. 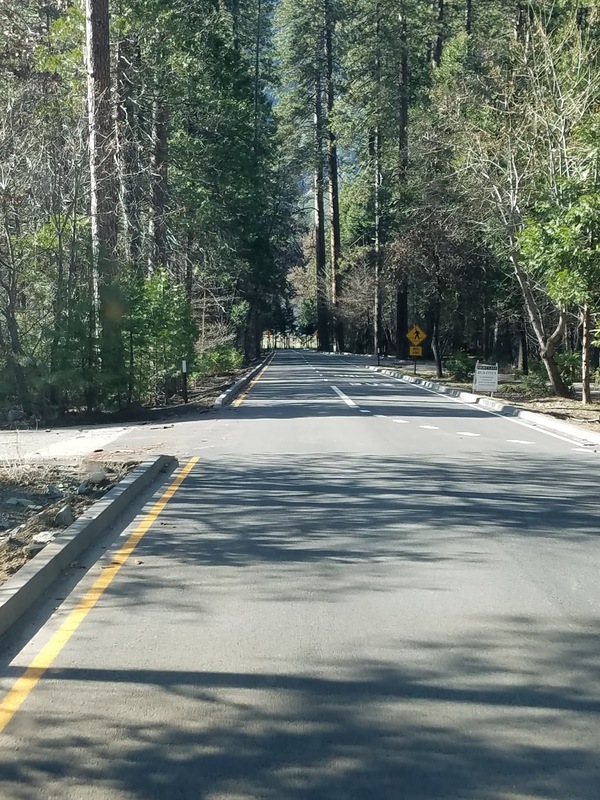 We postponed our trip to Sunday, and had a fine day, but we reversed the direction of our trip, because we still weren't sure if Yosemite Valley would open up in time for us to visit. If the valley remained closed, we wanted the choice of going to Hetch Hetchy Valley instead, and to allow that we needed to go by way of Highway 120 through Big Oak Flat and Groveland, instead of Highway 140 through Mariposa. I had heard that Moccasin Reservoir almost failed a few weeks earlier, but didn't give it much thought while I was bustling about trying to think of alternate field trip stops. We had left the Red Hills Area of Critical Environmental Concern and were approaching the Priest Grade when I remembered the dam episode. During an intense storm on March 22, floodwaters overwhelmed the spillway of the small earthen dam on Moccasin Creek. Moccasin Dam is about 700 feet across and about 60 feet high, holding back about 554 acre-feet of water when full. There is one very strange fact about the dam. Even though it blocks Moccasin Creek, it doesn't hold water from Moccasin Creek! In instead contains Tuolumne River water that has been diverted into the Hetch Hetchy system and pumped through a hydroelectric plant on lower Moccasin Creek. The dam is a small forebay that feeds into the much larger Don Pedro Reservoir and Lake just a mile downstream. Moccasin Creek was heavily mined during the Gold Rush, and the sediments may be contaminated by mercury and other toxic metals related to the gold extraction process. The water of Moccasin Creek is diverted around the reservoir. As we drove by, I commented on the radios that the flood had happened, but I saw that a lot of the damage was visible from the highway and we screeched to a stop to have a look. It had clearly been a serious storm. The flood had ripped out trees, roads, and telephone poles. The dam itself looked undamaged, but the spillway downstream had been severely eroded. Few people were threatened by the flooding, but roads were closed. If the dam had failed, the effects would have been limited because Don Pedro Lake, only a mile downstream, would have easily absorbed the extra water. 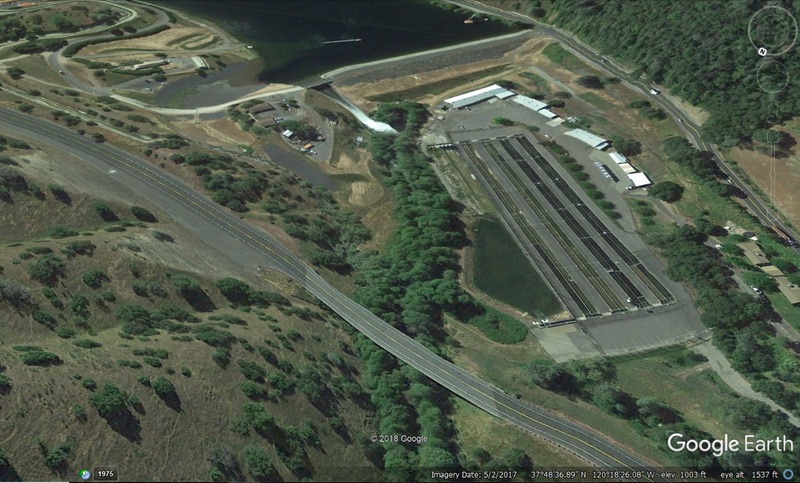 Maybe the saddest aspect of the flood was the near destruction of the fish hatchery. 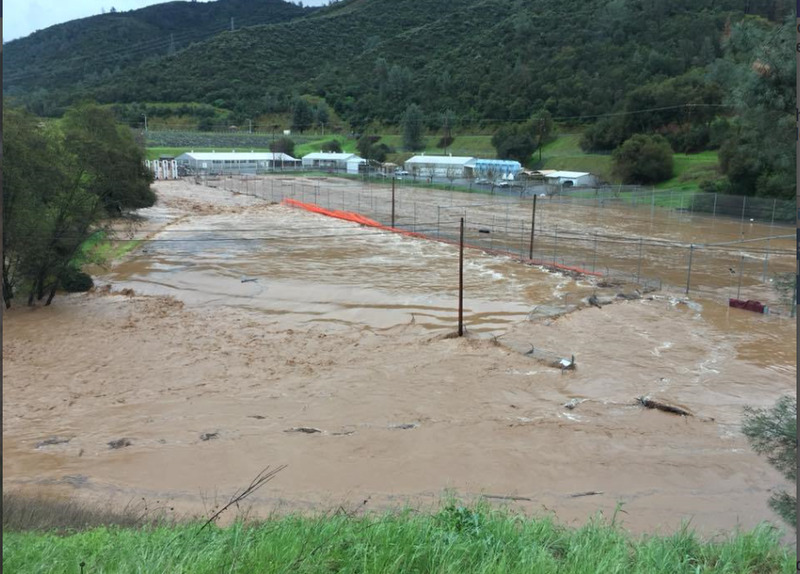 As can be seen in the picture below by Mark Brooks and aired on several news outlets, the entire hatchery was flooded, and all of the fish either killed by turbulent mud, or carried downstream to Don Pedro (when does fishing season start?). Geology and weather are capricious beasts. One of the lessons of the earth sciences is that no place anywhere on this planet is free of the possibility of natural disasters. Some places are more dangerous than others, but there is always a big advantage to understanding the possible hazards where one lives and works. One may think they may never happen in one's lifetime, and they might not, but that's a dangerous gamble to make. Yosemite National Park is a treasure. And the gem of the park is Yosemite Valley. There are spectacular spots to visit throughout the park and region, but ultimately, the sheer granite walls and booming waterfalls are the heart of this part of the Sierra Nevada. Most people know this of course, and the valley struggles with the desires of millions of people who wish to see the park for themselves. There are horror stories of absolute gridlock throughout the valley, with upset families who wait for hours just to get into the park, and then never find a place to park and get to know it better. I can barely imagine the frustration of devoting a hard-earned vacation to see the place and then have it spoiled by the chaos of too many people. I've been privileged to live relatively close to the park, and in 30 years, I've been there over a hundred times. I've quite literally never had a bad time, but part of the reason is that I've been able to pick and choose the times I visited. It turns out that the time most people set aside for vacation, in July or August, is possibly the least interesting time to do so. It's still spectacular, but the crowds are the worst, the waterfalls mostly dry, and it's hot. In fall, the valley is quieter, and the oaks and dogwoods add a splash of color. Winter brings snow and silence. Spring is noisy because of the waterfalls booming from the canyon rim. If your schedule allows, go there in the off season! Ribbon Falls only flows in the spring; it's the highest free-falling waterfall in the park at 1,612 feet. Of course, if you come at another time of year, you would be taking a chance with the weather. That's what happened to me last week. I was scheduled to take my students there on Saturday, but fate intervened with an epic warm tropical storm that dumped inches of rain on the snowpack. 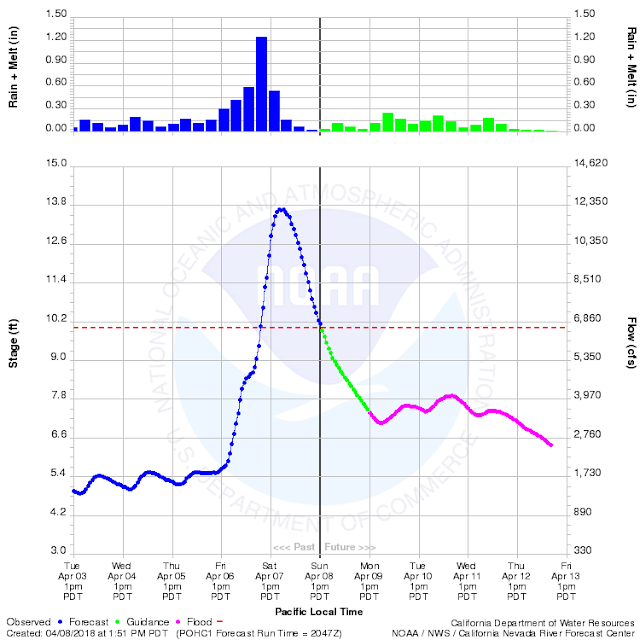 The Merced River swelled to nearly 14 feet (10 is official flood level) and major roads in the valley were under a few feet of water. For one of very few times in its history, the park was closed as a precaution and people were evacuated. I was luckily able to reschedule for Sunday, because the sun came up in a cloudless sky and the difference between the two days was astounding. Upper Yosemite Falls, 1,430 feet high, the second highest in the park after Ribbon Falls (above). I included some direct comparisons between Saturday and Sunday in my previous post (with thanks to the Park Service for posting pictures of the storm). Today I am offering views of some of the classic views in the park, revealing the vast amounts of water still flowing into and through the valley. The Merced River had subsided somewhat but was still flowing at flood level, but only barely. The main effect was the low-lying valley meadows that were still underwater (the next two pictures). 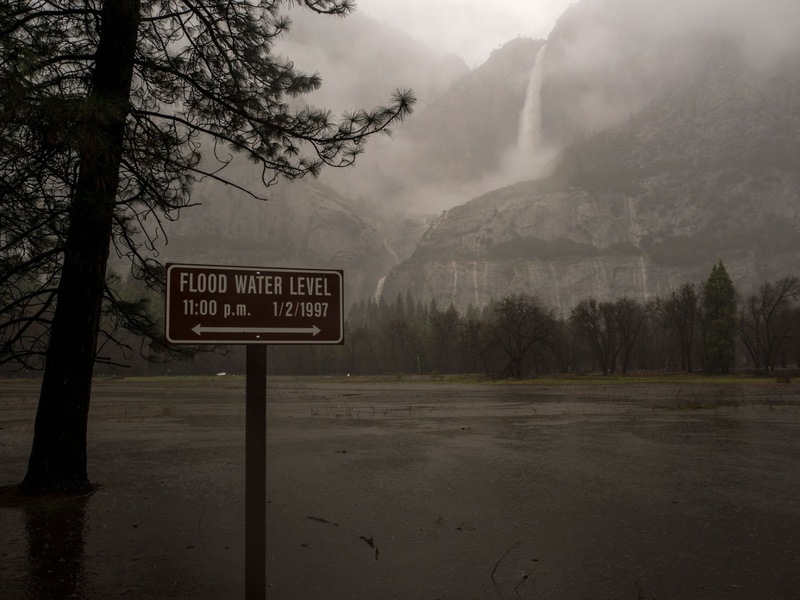 A flooded Cook's Meadow forms the foreground for Upper Yosemite Falls. The occasional flooding of the meadows is part of what maintains the meadows as open areas. Tree saplings are smothered underwater, and only grasses and sedges that can survive the high water table. Not all of the meadows have survived however. Since the park was established, some of the original meadows have progressed into thick forest...there are only about 65 acres of meadows left out of the original 745 acres that existed at the time of European discovery. The growth of the forest is largely the result of fire suppression. The park service will occasional burn some of the meadow margins on purpose to help maintain the integrity of the open spaces. Directly across from Half Dome are North Dome and the Washington Column (below). The Royal Arches, in the center-left of the picture, are the result of a sort of reverse exfoliation, where the rock snapped out and fell from the middle of the arch, instead of the overlying cliff. At the end of our day, we made a final stop at Valley View, one of the unheralded pullouts (only eight parking spaces) with one of the finest views to be had in all the valley (which is maybe why they call it "Valley View"). El Capitan, the sheer 3,000 feet cliff, looms on the left, while the Cathedral Rocks and Bridalveil Falls dominate the right side of the valley. A swollen flooded Merced River fills the foreground, with Bridalveil Meadow just across the raging waters. Only one of the ice age glaciers made it past this point, the so-called Pre-Tahoe (or Sherwin) Glaciation that took place around 800,000 years ago. 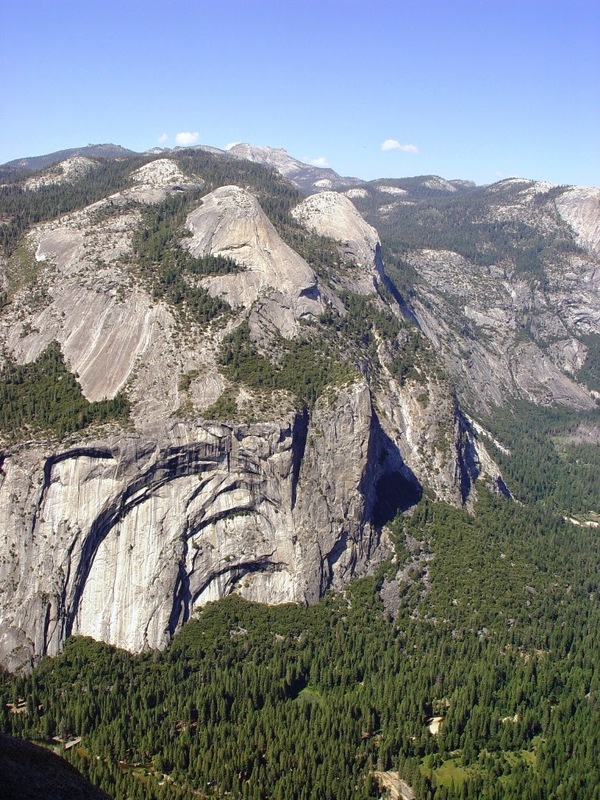 The subsequent Tahoe and Tioga glaciers only reached the base of El Capitan and Cathedral Rocks. The Pre-Tahoe Glaciation probably did the most work in shaping the valley we see today. I promised in the title of the post that we would include a sight I have never seen in more than 100 visits to the valley. We arrived that day when the gates to the valley reopened, at noon. A great many other people arrived at the same time, and for the first two hours the valley felt crowded. But by 4 PM, most of the visitors were already on their way back home, and the parking lots were practically empty. That is a sight in itself. But it was the drive out that astounded me. Every time I visit the valley, Northside Drive from Curry Village to the Visitor Center area is always full of cars. Always. But these two pictures show the astounding sight...not a single car ahead of us or behind us. For a few precious moments, we had the valley to ourselves. It's something I've never seen before, ever. There's a secret though...even on the most crowded days in Yosemite Valley, you can find peace, serenity, and quiet. It requires that you park the car and get out. Not every trail is crowded, and in some places you can make your own path through the forest. The number of fellow hikers decreases exponentially with the distance from any paved road. If you are ever given a precious few moments in this grandest of valleys, give it a try. You won't regret it. First off, thank you to the National Park Service for making the flood photographs available on their Facebook page. And second of all, kudos to the National Park Service for weathering the flood and opening the park again so soon afterwards. I was in Yosemite Valley today, leading my students on a postponed field studies class in the park. Why did we postpone the trip? Well, mainly it supposed to take place on Saturday, but it turned out that the valley was in the midst of dealing with one of the larger floods it has experienced, about the fourth or fifth largest in 30 years or so. Plus, they closed and evacuated the park in advance of the storm. They only opened up again at noon today, and we were at the park boundary at precisely 12:11 PM. The storm was epic. It was an atmospheric river storm, a "Pineapple Express" that brought many inches of very warm rain to a snowpack that had fallen only in the last few weeks. Rain was falling at elevations as high as 10,000 feet. The runoff gathered quickly into the streams and rivers, and the Merced went from around 1,000 cubic feet per second to more than 12,000 cfs. Water level at the Pohono Bridge gaging station rose from 5 feet to almost 14 feet. For reference, official flood stage begins at 10 feet, and at 12 feet the main valley roads are covered with water. It could have been a disaster if the valley had been full of tourists. But instead, the weather cleared, and the park service maintenance people worked quickly to clear debris from the roads and bridges. It couldn't have been easy, and there were lots of anxious tourists hoping their vacations wouldn't be totally ruined. They came through, and now you can compare the difference 24 hours can make. 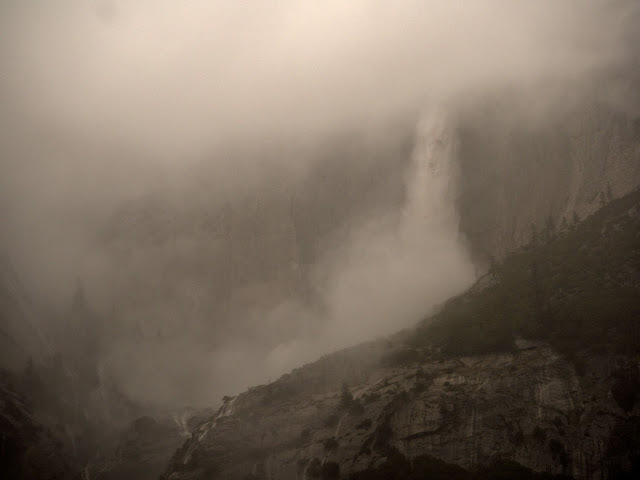 24 hours ago, clouds obscured the cliffs, and one could barely making out the raging torrents of Upper Yosemite Falls. This afternoon, there was not a cloud in the sky, and while slightly diminished in volume, the falls were as powerful as they will probably be for the rest of the year. The river rose to cover Cook's Meadow, but as the sign shows, nowhere near the level of 1997's even more epic flood. The discharge was twice as high then as it was yesterday, at 24,600 cubic feet per second. Today the sun shone brightly on a still-flooded meadow, but the water had receded enough that we could follow the boardwalk across the open space. I may be posting more pictures soon, but I had to lead off with these since by chance I was standing close to where the photographer was standing yesterday. Be warned: cuteness alert. 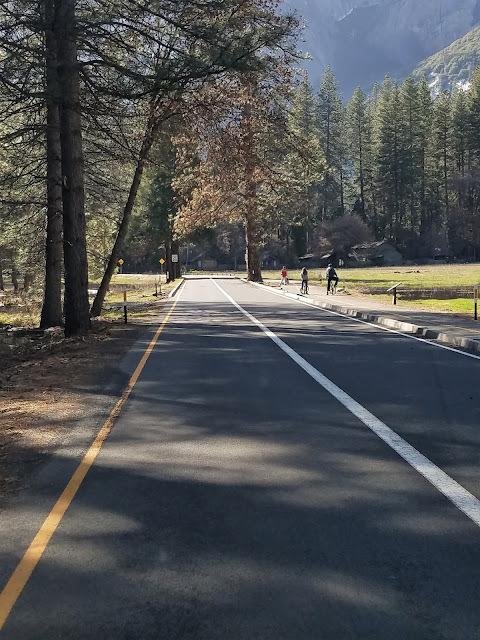 I was out on the Tuolumne Parkway Trail this afternoon, checking things out after more than two inches of rain in two days. It was sunny and lots of birds were out and about, but just before I got to the end of the trail, I saw something I've never seen before: a fox family. I've seen foxes a number of times over the last three years. One fox that I photographed early on was actually used on the interpretive signs for the trail. I could never figure out from year to year if I was looking at a family or not because I never saw more than one at a time. Red Foxes are one of the most widespread carnivores on the planet, being found across the northern hemisphere. The populations in California are a mixture of native and non-native individuals. The rarest is the Sierra Nevada Red Fox, which is only found in the northern Sierra and southern Cascades at high elevations. 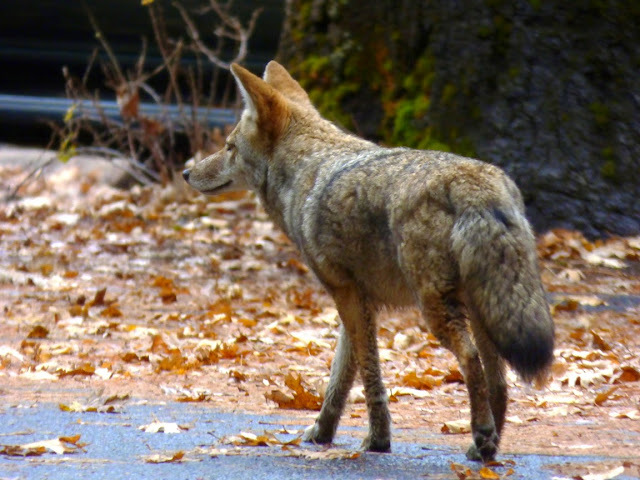 It was recently sighted in the vicinity of Sonora Pass, north of Yosemite. The populations in the Central Valley were thought to be escapees from fur farms, but recent work has determined that the valley north of Sacramento has an endemic population. There seems to be little if any information about native Red Foxes in the south valley. There is a native species, the Gray Fox, which I have seen once or twice along the river. There is also the rare and endangered San Joaquin Kit Fox, which I have never seen. I hope I'll have a chance to watch them grow up!